A roasted chicken with potatoes and a simple salad for dinner. Vanilla ice cream for dessert. For a man who makes a living cooking grilled branzino with celery root puree and ricotta fritters with cardamom blueberry sauce, Unum owner and chef Phillip Blane is drawn to the basics. Phillip loves food. Like most cooks, he’ll eat anything. But it’s the comfort food—the familiarity of those simple dishes—that most often call to him. 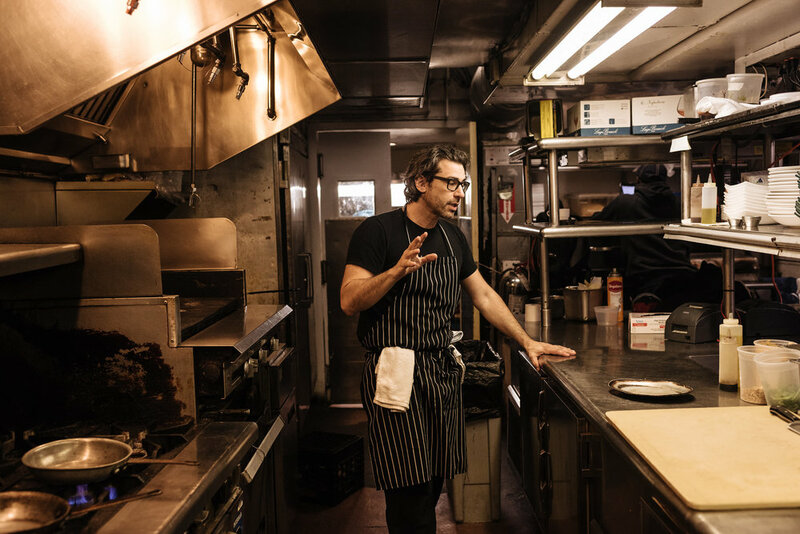 He got his first taste of the restaurant business working in a wine bar in London during high school—fascinated by what was going on in the kitchen. That summer, he got his foot in the door. Instead, Phillip got a masters degree in healthcare administration and managed assisted living facilities. Yet, at 33, he had a change of heart. Phillip met a couple who’d also experienced a life change—a corporate buy-out and the fall-out after 9/11 nudging them toward opening a little boutique hotel on the Eastern Shore. He got a job in the hotel kitchen—his first time at the helm. But Phillip succeeded, and someone noticed. Specifically, DC chef Todd Gray’s parents, who came in one day for dinner and told Phillip their son was hiring. Ready to leave small town Maryland, Phillip traveled for a bit before accepting a job at Todd’s Equinox restaurant. While working in DC, Phillip met another important person—his future wife. Laura had an apartment on Thomas Jefferson Street and as the relationship progressed, the couple discussed Phillip’s aspirations to open his own restaurant. Five and a half years later, you’ll find Phillip at Unum—doing everything from working the line to paying the bills and cooking the special of the night. After looking in Cleveland Park, the Palisades and H Street, he’d jumped at the chance to rent an M Street building when it became available—formerly Mendocino Grille, where Laura met Phillip’s parents for the first time. In addition to neighborhood residents-turned-regulars, Unum hosts its share of celebrities and politicos. But Phillip won’t cook and tell. Phillip, on the other hand, goes home. After a full day in the kitchen, ‘elaborate, chef-driven meals at home’ just aren’t happening. So what does the at-home menu look like for a chef? Phillip cooks batch food—eggplant parmesan, beef for his son’s Taco Tuesday ritual, roasted chickens. At Unum, the menu changes frequently, save a few permanent favorites that are off limits. The new American restaurant incorporates a variety of cuisines based on Phillip’s travels and DC’s own international influences. The world is going global, and Phillip says their food—and name—reflects that. Unum came from e pluribus unum. Out of many, one. DC’s current restaurant scene could also be described as such. Out of many, Unum is just one. Like the familiarity of a roasted chicken and vanilla ice cream, Unum isn’t going anywhere—and neither is Georgetown.